We are carried away by the beauty of this voyage that says everything of an incomparable work. A great challenge for a great success. 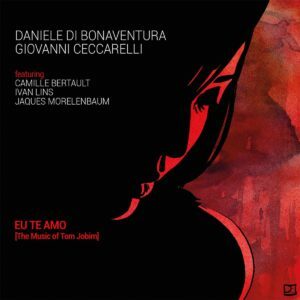 The magic (of album “Eu Te Amo – The Music of Tom Jobim”) involves us immediately, each track is a call to the strongest emotions. With an infinite sensitivity, the bandoneon-piano duet and their guests, Ivan Lins, Jaques Morelenbaum, and Camille Bertault deliver an elegant and subtle opus. A tribute full of grace to the Brazilian composer. Franch website “Latins de Jazz… & Cie”, 2019. French website “L’Invitu”: page dedicated to Daniele di Bonaventura’s discography, 2019. French magazine “La Depeche”: article about Camille Bertault and her participation to the album, 2019. Live performance and interview at radio program “Musiques du Monde”, RFI, France, 2019. Interview at radio program “Deli Express”, TSF Jazz, France, 2019. Live performance and interview at radio program Stereonotte, Radio1, Italy, 2019. Broadcast at radio program “Open Jazz”, France Musique, France, 2019. Broadcast at radio program “L’Actualité du Jazz”, France Musique, France, 2019. Broadcast at radio program “Jazz. Un Disco al Giorno”, Radio Start, Italy, 2019. Broadcast at radio program “Lusitania”, Radio Aligre, France, 2019.